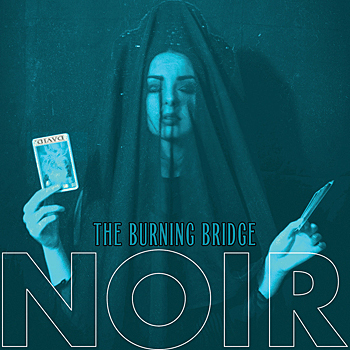 Metropolis records will be releasing the latest EP from New York darkwave act NOIR, titled The Burning Bridge, the band’s first helping of new material since 2013’s Darkly Near. Dedicated to the late art and music pioneer David Bowie, The Burning Bridge is set for a release date of May 27 as a digital only single; the title track was written by NOIR’s Athan Maroulis and Adoration Destroyed and 16volt member Erik Gustafson, an extended version of which is also slated to appear on the upcoming fourth volume of the Electronic Saviors compilation series. Accompanying “The Burning Bridge” will be three cover tracks – MINISTRY’s “Same Old Madness,” Duran Duran’s “The Chauffer,” and a live rendition of Roxy Music’s “Every Dream Home a Heartache,” recorded in December of 2013 for WFMU radio. The NOIR lineup for The Burning Bridge consists of vocalist Maroulis backed by keyboardists Gustafson, Kai Irina Hahn, and Demetra Songs. Pre-orders for the EP are now available via the Metropolis Bandcamp and webstore.